I’ve had a chance to ride the Strida for a full week of commuting. My bike commute is usually a 3 mile ride from the train station to my office, though last night I took it about seven miles across Silicon Valley. The single speed and light weight Strida 5.0 is perfect for short commutes to get you the last mile from the bus stop or train station. I average about 10 mph without breaking a sweat over the 3 mile commute. While it’s no speed demon, riding this bike is certainly faster and easier than walking. 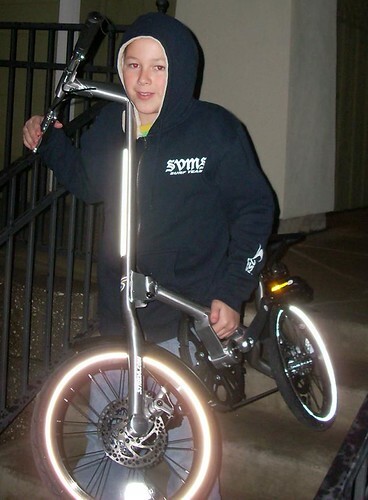 Details about the shakedown cruise are below the photo of my son with the Strida. Control. The Strida folding bicycle is squirrelly and takes some getting used to. You’re not going to ride a straight line with this bike, but once you remember to keep your hands on the handlebar you should be okay. Standover. Some people express concern about the lack of standover — the “top tube” angles straight up directly in front of your sensitive parts. It was only a problem for me once, when I veered into a curb and came to a sudden stop and *crunch*. Mostly, though, you don’t even notice that you’re straddling a metal tube. Mounting and dismounting is a breeze. Skirts. Women and men who like to bike in skirts won’t like the Strida. Upright seating. If you like sitting upright on a bike, you’ll really like the Strida. Unfortunately for me, the drawbacks of upright seating outweigh the benefits. There’s a reason long distance cyclists like to be hunched over — we’re leaning on the handlebars to split our body weight three ways between our arms, our legs and our rear, with probably 20% of our weight on the saddle. The upright, feet-forward geometry of the Strida, however, means that almost all of my weight is on the bicycle saddle. That’s okay for short distances, but my three mile commute is about the limit of what I can comfortably handle. Carrying stuff. Messenger bags typically work well for me because they ride low on my hip. When I ride even moderately ‘hunched over’ on a road bike, the weight is on my hip, not on my shoulder or back. The Strida 5.0 with its upright seating means almost all the weight I’m carrying is on my right shoulder and my back. I don’t carry too much weight, but I can feel the bag compressing my spine as I ride. For the Strida, a more conventional backpack of some kind might be more appropriate. Rear rack. My panniers can kind of hook on the thick plastic tubes of that rear rack. I haven’t actually tried using panniers on a real commute yet, though. The 10 lb. weight limit is a real limitation for me. Hills & belt slippage. In normal riding the belt rolls smoothly. I can make it slip if I really jam down on the pedals while going up a steep grade, but this isn’t a bike for hard riding so it shouldn’t be a problem. Power. A warning sticker tells me to avoid pedaling out of the saddle, and standing to apply power to the pedals feels very awkward and unbalanced on the Strida. I’ve had to walk this bike up very steep grades such as pedestrian overpass ramps. Disc brakes. The disc brakes on the Strida 5.0 are reliable and strong. The bike came with the brakes perfectly adjusted. There’s a goofy warning sticker advising riders to apply the rear brake before the front brake — with the uneven weight distribution toward the rear, there’s almost no way you can flip this bike end over front. The brakes are strong enough that I can easily make the rear wheel jump up, so there is a danger of stopping quickly enough so that you can rack yourself against the upward sloping top tube. Wheelies and other tricks. Another sticker cautions against popping wheelies, and the user manual warns against riding off curbs. While the bike is solidly constructed, it is very lightweight. As I mentioned previously, I’ve already popped the top ball joint out by accident so I can picture the frame coming apart if I try riding down some stairs. That said, when I first hopped on the Strida I rode a wheelie a good 20 yards almost by accident because the front end is so unweighted. You get used to it pretty quickly, but for the first little bit of riding the Strida folding bicycle you have to think to keep that front end on the ground. Rain riding. The Strida 5.0 performs admirably in light rain. I was a little skeptical of the flimsy looking half fenders on the Striday, but they do a good job keeping my shoes and legs dry. The tires hold rain slicked road just fine, and of course the disc brakes are not affected by wet conditions. I haven’t tried riding the Strida in a real rain storm yet, and I’m not sure I ever will. Strida advises against riding this bike in snowy or icy conditions. Strida also advises against riding their folding bikes in extreme cold, probably because the plastic parts become more brittle and can break. My next post on the Strida 5.0 will be about the practicality of hauling this folder on buses and trains. Read more on the Strida 5.0 folding bicycle. Other Strida 5.0 reviews are at Ride This Bike and Bicycle Design. Find local dealers and online purchase information in the UK, Europe, Canada, the USA and worldwide at Strida.com. For its intended role, and market Strida is excellent. I disagree about the upright seating position being wrong – maybe for cycling racers and enthusiasts BUT for the target commutor market its just right .. in fact better for visibility, and for the back. For verification of this see the types of bikes ridden in Holland, Denmark, etc. where bicycles are a real communting tools for everyone, not just enthusiasts … these bikes all have the up right posture you dont like … with most weight on saddle. With most of the weight over the rear wheel, I assume that the sticker warning to brake with the rear wheel before the front is intended to keep inexperienced riders from locking the front wheel: a good way to end up lying down in traffic. Even in the Netherlands and Denmark, you have the option of leaning down on the handlebars when you want to give your bottom a brief rest. I’ve seen it done — it’s not a “racer and enthusiast” position, just a relaxed leaning over, like you do when standing next to a bar. Try it on the Strida and you lose control of the bike. “Try it on the Strida and you lose control of the bike”. I guess its down to personal prefs … I’m very happy with Mine. I wouldn’t try hanging panniers or a handlebar bag either. I would recommend that Strida consider coming up with some mechanism to hang a briefcase within the triangle formed by the frame. It’s the center of gravity. By the way, I’m enjoying my Strida. My biggest beef is that it’s a single speed but Strida/Ming is working on a multispeed model. The brakes are very strong. The Strida. It’s simple; it’s greaseless; it’s fun. My wife has ridden her Strida 3.x on a 34 miles trip in one go with no problems. She also finds it great when wearing a skirt. I’ve ridden mine > 20 miles in one trip. We both prefer the upright riding position for sightseeing. It’s only a problem in high winds when you need a low profile. We have the seats really high, so that we can only stop on tip-toe. That way we get maximum power into the pedals, & rarely have to walk up quite steep hills. We’ve taken them on holidays where their small “footprint” means they’re easy to accommodate in other transport, eg. airplanes, buses. Strida’s the only folder I’d consider for commuting < say 10 miles, as it’s *reliable* – no messing with caliper brakes, oily chains, fiddly gears, & punctures can be fixed quickly without removing the wheels since the forks are cantilevered. Many folders have sensitive steering, & most riders adapt to that quite quickly. I fitted bar ends to mine & really long rides are fine with no hand numbness. I’ve had about 20 lbs of shopping (nearly as much as the Strida itself) on the rear carrier, with a bungee going under the seat & around the bag, & the bike’s just fine with that load, so I suspect there’s a big safety margin on the carrier. As others have said, a really fun bicycle, & I hope you have lots of fun on your Strida. Apparently manufacturing has been outsourced to Ming cycle in Korea however I found that there are hundreds, possibly thousands of other Asian manufacturers of the bike! Granted, they don’t all call themselves Strida. I don’t know how they can do this. As they are all virtually the same. There is no way of knowing if you are getting one made by Ming cycle or by any other manufacturer for that matter — or if the other manufacturers are even inferior in any way. I read all this, have tried a Strida – and it’s just over-priced! It’s even worse for the new 2 speed – $1400! It’s for people with way too much disposable income and a thirst for status. Puh-lease..
Rider: Stridas in the US start at 7 to $800, and for that you do get a lot of technology. Like on an iphone, it takes work to get the the clean lines – aimed at commuters and especially multi-modal commuters. eg belt drive for no chain ‘tattoos’ on your pants. :). There are copies from far east, but I wouldn’t trust them to ride on (no testing, no use of proper heat treated frame materials, etc.) in fact these are just SLO’s (Strida Looking Objects). You can get a metal rack to increase the carrying capacity. great info, love my bike go everywhere on it. never had a car or learnt to drive.